Despite concerns that political turmoil would dampen holiday spending, ecommerce sales made a strong showing in 2016. Even with a sluggish November start, revenues increased by 11 percent over 2015, according to Adobe Digital Insights. Digital commerce measurement firm Slice Intelligence reported a more generous 20 percent year-over-year ecommerce uptick, saying the two extra shopping days in 2016 accounted for the growth. The good news did not extend to physical store merchants, however. 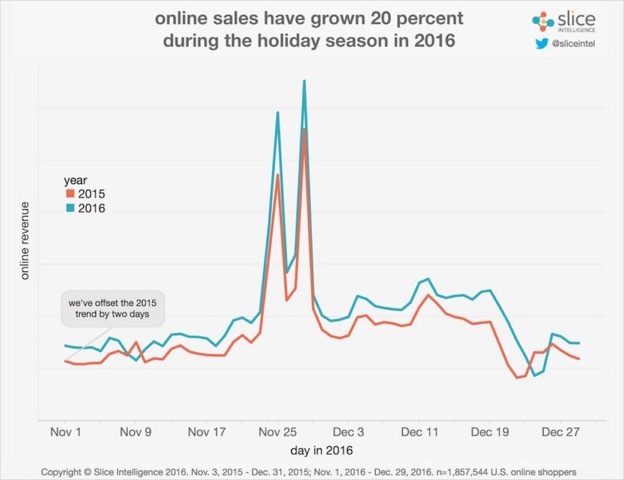 Slice Intelligence reports that online sales holiday ecommerce sales grew 20 percent in 2016 over 2015. Point-of-sale transaction processing firm First Data Corp’s Holiday 2016 SpendTrend report showed an overall 4.7 percent year-over-year increase in combined online and brick-and-mortar consumer purchasing for the 2016 holiday season, up from a 1.8 percent increase in 2015. These percentages apply to credit card transactions only. Between November 1 and December 31 shoppers spent $91.7 billion online, according to Adobe Digital Insights. During that time period, 57 out of 61 days garnered over $1 billion in ecommerce sales. Eighty-six percent of the revenues came between November 1 and December 20. Fifty percent of website visits came from desktop computers and the desktop share of sales was 69 percent. 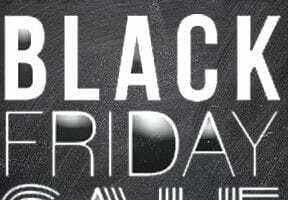 Slice Intelligence reported that consumers spent 48 percent of their total holiday spending in the month of November. The number of online transactions was up by 12 percent year-over-year. A total of 21.3 percent of all holiday spending was conducted online in 2016, compared to 15.4 percent in 2015, according to First Data Corp.
Fifty percent of holiday website visits came from mobile devices — 41 percent from smartphones and nine percent from tablets. Mobile ecommerce accounted for $28.4 billion in sales, a 23 percent increase over 2015. Smartphones contributed $19.3 billion, while tablets drove only $9.2 billion in sales. Thirty-one percent of total holiday purchases came from mobile devices, mostly smartphones. Overall, brick-and-mortar stores saw sales growth of 1.6 percent year-over-year but department stores suffered a 4.8 percent decline from 2015. Only the western states showed growth in physical stores sales with a 4.8 percent increase. Macy’s, the largest department store chain in the U.S., reported a 2.1 percent drop in holiday same-store sales from 2015 and announced over 10,000 employee layoffs and 68 store closures. Kohl’s suffered a similar 2 percent decline. Sears Holdings Corp., which owns Sears and Kmart stores, reported a 12 percent drop in same-store holiday sales and will be closing 150 stores. At the beginning of 2017, women’s apparel chain The Limited announced that it was closing all of its 250 stores. Retail analysts expect more store closures, layoffs, and possible bankruptcy filings, including Sears Holdings Corp. in 2017. The principal beneficiary of the brick-and-mortar slide was Amazon. According to Slice Intelligence, Amazon’s share of U.S. ecommerce sales grew significantly, especially in the 10 days before Christmas. From November 1 through Cyber Monday, Amazon’s share of ecommerce was 33 percent, compared with 44 percent during the final stretch —December 15 through December 25. 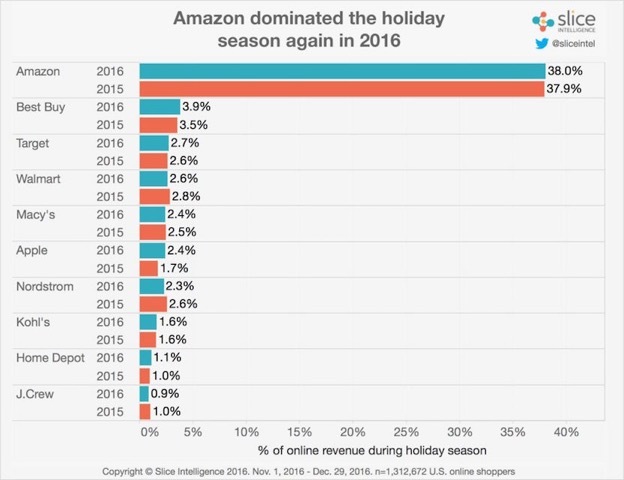 This was consistent with Amazon’s share during the 2015 holiday season and Amazon finished the 2016 holiday with a total share of 38 percent, roughly the same as 2015. No multichannel retailer came close to matching Amazon’s share of total online holiday sales. Slice Intelligence reports that no other retailer came close to Amazon in the 2016 holiday season. Amazon received 38.0 percent of online holiday revenue. Best Buy, at second, received 3.9 percent. The Echo and Echo Dot voice-activated artificial-intelligence speaker devices were the best-selling products from Amazon this year. Demand was so high, the company reported, that it could not keep them in stock. The best selling third-party items were headphones from three different manufacturers. Other Amazon shopping tidbits include the following. The number of merchants using Fulfillment by Amazon increased by 70 percent in 2016 and Amazon delivered more than 2 billion packages for independent merchants, more than twice what it delivered in 2015. Over 1 billion Prime and Fulfillment by Amazon items were shipped globally during the 2016 holiday season. Amazon Prime acquired 3 million new Prime subscribers in the three weeks before Christmas Day. Over 72 percent of Amazon customers shopped on a mobile device, up from 70 percent in 2015. As brick-and-mortar stores continue to struggle, ecommerce holiday sales will likely show substantial gains again in 2017. Large retail chains can survive by encouraging their customers to shop online but that means they will likely have to close physical stores. The trend of consumers shopping for Christmas earlier in the year will continue with at least half of purchases occurring before December. While mobile devices will account for close to half of consumer browsing for products, desktops will remain strong for actual purchasing. Many consumers are still reluctant to buy via mobile devices.